Morales, left, and Kafker, right, from the Chicago Tribune. 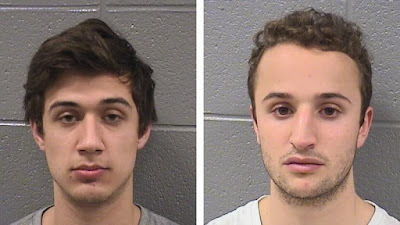 On 11 March 2016 Matthew Kafker and Anthony Morales, both freshmen at Northwestern University in Illinois, were caught on video vandalizing a Christian chapel at the university, leaving graffiti calculated to reflect badly on Donald Trump. The two were charged with institutional vandalism, hate crime to a place of worship and criminal damage to property. The claim that it is "out of character" for a Jew to commit false-flag vandalism and graffiti to advance a political agenda is ridiculous. It is in fact typical. There are many examples. 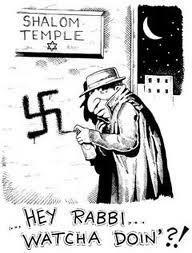 In this case, since the Jews were caught on video, they could not pretend that they did not do it. Yet they pleaded innocent! That's some chutzpah. Kafker hopes that claiming to have been rip-roaring drunk at the time of the crime will get him off the hook. It will be extraordinary if it works, since such an excuse never works for anybody else. In any case, what they did was not at all out of character -- for a Jew. The Hoopla about the “Alt Right"